Order in the next 7 hours 9 minutes and it will ship today! 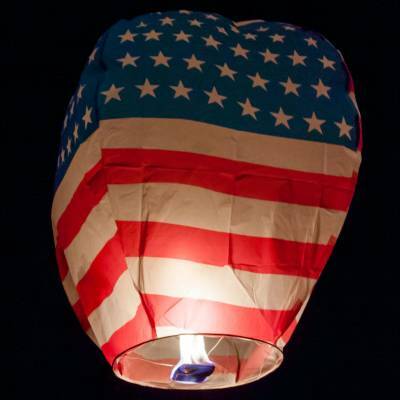 American Flag Sky Lanterns are the perfect for your next patriotic celebration! These Sky Lanterns have a small fuel source in the middle that, once lit, will lift the lantern slowly into the sky with a soft glow. These American Flag lanterns are made with fire-retardant, 100% biodegradable material. Each Sky Lantern comes folded and individually packaged. When fully inflated, our Sky Lanterns measure 39” tall, 16” in diameter at the base of the lantern, and 24” in diameter at the top of the lantern. Used them at our 4th of July pool party and they were a huge hit. Great Product, Worked Great. America. Great Product, Worked Great. America. Bought them for the 4th of July. I would buy this product again. I would buy this product again. Looks good gently floating away. Very calming. Kids love them.